We’d love your help. Let us know what’s wrong with this preview of Het verraad by Raymond E. Feist. To ask other readers questions about Het verraad, please sign up. How has Midkemia skipped the TV Bubble? Feist takes us back in time! After progressing the timeline through the Serpentwar Saga, there is a break in the action where we return to post Riftwar Mikidmia and revisit some of our favorite characters, meet some new ones, and go on some adventures that take place to fill in the gaps between other books in the series. I am reading it now because I am reading in publication order. I have seen a list with the books chronologically, but I feel like if this is the order Feist wrote them in, it's Feist takes us back in time! After progressing the timeline through the Serpentwar Saga, there is a break in the action where we return to post Riftwar Mikidmia and revisit some of our favorite characters, meet some new ones, and go on some adventures that take place to fill in the gaps between other books in the series. I am reading it now because I am reading in publication order. I have seen a list with the books chronologically, but I feel like if this is the order Feist wrote them in, it's the order I should read them in. The start was a bit slow for me. Jumping back in time, reaquainting myself with the characters, and trying too remember what happened in the story line (and what was yet to happen) was a bit tough. However, after about 100 pages or so, it started to flow pretty easy and it kept going to a bang up finish. On the cover, it mentions it is book one of a series, but there really isn't a cliffhanger and everything is wrapped up nicely. So, it will be interesting to see what they do with the next book. If you are into the Riftwar and wonder if you should keep reading, I think it stays great, so keep on reading! Ilana C. Myer My husband and I still enjoy it, but YMMV! Bradley That is high praise. :) I think I shall revisit it soon. I have the impression that the books of the Riftwar cycle can be divided into two categories. In the first are those books that are part of the epic series that refer to the great war events that have affected the fates of the world. These are more detailed writing, with slower plot, and generally more ambitious. In the second category, where this book belongs, are the smaller scale, self-contained stories, which are much smaller, simpler, have a fairly fast plot and usually rely more on the act I have the impression that the books of the Riftwar cycle can be divided into two categories. In the first are those books that are part of the epic series that refer to the great war events that have affected the fates of the world. These are more detailed writing, with slower plot, and generally more ambitious. In the second category, where this book belongs, are the smaller scale, self-contained stories, which are much smaller, simpler, have a fairly fast plot and usually rely more on the action and the interaction of the characters. The books of the first category have made a strong impression to me, with some of them having a place in my favorites. The books of the second category are definitely interesting, adventurous and surely the reader is amused by reading them, but, personally, I want something more. This book has these elements, even more intense as it comes essentially from an electric game. It is a good adventure, very well written and very exciting. I liked it but not enough to consider it extraordinary. Έχω την εντύπωση ότι τα βιβλία του κύκλου του Riftwar μπορούμε να τα χωρίσουμε σε δύο κατηγορίες. Στην πρώτη ανήκουν αυτά τα βιβλία που είναι μέρος των επικών σειρών που αναφέρονται στα μεγάλα πολεμικά γεγονότα που επηρέασαν τις τύχες του κόσμου. Αυτά έχουν περισσότερο αναλυτική γραφή, πιο αργή πλοκή και γενικότερα είναι πιο φιλόδοξα. Στη δεύτερη κατηγορία, όπου ανήκει αυτό το βιβλίο, είναι οι μικρότερες αυτοτελείς ιστορίες, που είναι αρκετά μικρότερης κλίμακας, πιο απλά, έχουν αρκετά γρήγορη πλοκή και συνήθως βασίζονται περισσότερο στη δράση και στην αλληλεπίδραση των χαρακτήρων. Τα βιβλία της πρώτης κατηγορίας μου έχουν κάνει ιδιαίτερα δυνατή εντύπωση, με κάποια από αυτά να έχουν μία θέση στα αγαπημένα μου. Τα βιβλία της δεύτερης κατηγορίας είναι σίγουρα ενδιαφέροντα, περιπετειώδη και σίγουρα ο αναγνώστης διασκεδάζει διαβάζοντας τα, προσωπικά, όμως, θέλω και κάτι παραπάνω. I have fulfilled my annual quota of self-flagellation by forcing myself to finish this book. This book, which I later discovered was based on a video the author wrote, was the stupidest "You have completed Quest A! Now I need you to complete Quest B!" chain of events I have ever subjected myself to. Forced camaraderie and ridiculous dialogue round out the brutality of this kick to the groin. By the end I was skimming like mad, assuming I could just read the 'previously in' section of book 2 of this series to figure out anything I missed, I was that bored. Feist has a very distinct style. He is, above all else, interested in plot. The plot often meanders, and very rarely deviates from the 'quest is received, quest is eventually fulfilled' formula, but the thing that drives me crazy is that characters are pretty much ... nonexistent in his work. Locklear, my favorite character from th By the end I was skimming like mad, assuming I could just read the 'previously in' section of book 2 of this series to figure out anything I missed, I was that bored. Feist has a very distinct style. He is, above all else, interested in plot. The plot often meanders, and very rarely deviates from the 'quest is received, quest is eventually fulfilled' formula, but the thing that drives me crazy is that characters are pretty much ... nonexistent in his work. Locklear, my favorite character from the Riftwar series, is back here ... kind of. He's there for the first 100 pages, then just drops out of the plot for about 100 pages, then shows up again for act three along with Jimmy (now "Squire James"), basically at all times just acting like a clone of Jimmy. I was very excited to read this book (& the RW Legacy series in general) because, while its internal chronology places it next in line after the main RW books, it was actually written nearly a decade later, after stuff farther along had been dealt with, so I assumed Feist would have grown as a writer. But his worst excesses are even more bloated than normal here. I'm HOPING that this is in large part due to its being based on a computer game ('oh, we've reached a new town, what ridiculously involved plot will this setting's government get us entangled in?'). It reminds me of me playing an Ultima game. One hour in: "This is awesome! Everyone has such a full life & backstory!" Four hours in: "SHUT THE HELL UP ABOUT YOUR PIGS, FARMER JOHN! WHY DO I EVEN CARE THEY HAVE THE GOUT?!?" I haven't read the whole shebang with the actual mamuth series Feist wrote, but these books, in the Riftwar Legacy, I like a lot. A lot. From the first 10 pages of this, I was enthralled. It got me. I didn't leave it out of my hand, I wouldn't do anything else except read it. Of course, "Krondor: The Betrayal" doesn't reach the complexity and awesomeness level that some other well known works have had, but it's up there with the best, I think. It's a classical piece of fantasy, where 4.5 stars. 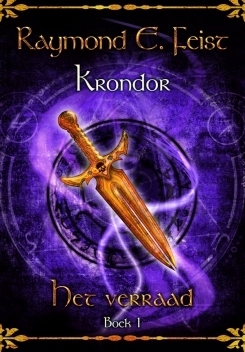 Of course, "Krondor: The Betrayal" doesn't reach the complexity and awesomeness level that some other well known works have had, but it's up there with the best, I think. It's a classical piece of fantasy, where you got your elves, your gnomes, your really big or evil monsters and you have to fight them all at the same time. There's magic, here and there, for lovers of it. In fantasy, I found, I need everything to blend nicely together, you know? The period of time, the language, the beings that populate the world that I'm reading about, they have to connect, in some way. I even pay attention to clothing, if that is possible in their time and if nothing is missed out, I'm happy. The only positive of this book is Gorath, who is a pretty likable character that should have been featured in the original series instead. The book itself is pretty much what it is supposed to be - a linear game story, with the basic 'move to the point A - kill monster - move to the point B - repeat' formula. Another weak one. 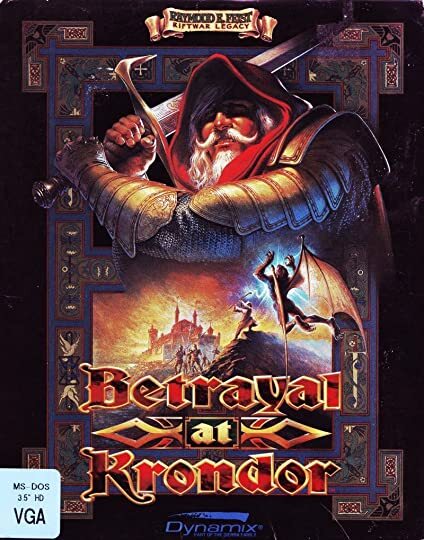 When I was in high school I played the game "Betrayal at Krondor" and I was fascinated by its rich setting and engaging plot. Later I realized that was because the game was based on a popular fantasy book series by Raymond Feist. I read the first book of the series later on and while it had a decent start, it quickly grew dull. I've tried several times to pick up the series again, to no avail. Years later, urged by nostalgia, I decided to read "Krondor: The Betrayal", which had been gathering dus When I was in high school I played the game "Betrayal at Krondor" and I was fascinated by its rich setting and engaging plot. Years later, urged by nostalgia, I decided to read "Krondor: The Betrayal", which had been gathering dust on my bookshelf for years. I thought, having forgotten the plot of the game almost entirely, I would be able to experience the same excitement that I once had with the game. I was wrong. Put simply, this book is boring. The plot is all over the place and hard to follow. The whole routine of travelling from town to town and performing "side quests" while fighting battles along the way works much better in a game than in a book. I realized one of the reasons I loved the game so much was the freedom to explore the rich world of Midkemia to my heart's content. That was lost in book form. The characters are pretty dull. James and Locklear seem like copies of each other with one defining quirk (stealing and philandering respectively) mentioned from time to time just to remind us who is who. Owyn is just a younger version of Pug, but without the endearing personality that makes you want to root for him. Even though he is frequently placed a desperate situation, I never felt him suffer or be afraid. Even when characters die, they are just mourned for in a couple of paragraphs. The impact was lost on the reader as well, since those characters' personalities are paper-thin. The only good character is Gorath but he alone could not save this book. The rest of the characters feel like NPCs - so one-dimensional and void of personality. It was hard to remember and understand the motivations for the actions of the various villains, which made following the plot even harder. I could understand the constant moving from place to place but I never saw the bigger picture. There was no tension in the story - even when some of the heroes were besieged and facing impossible odds, I never felt any despair for them. Maybe because the writing was so flat. Ve srovnání s jinými knihami od R. E. Feista slabší, i tak ale dobré počtení. Za mě hodnocení 3,5 z 5. De start ging wat moeizaam, zeker doordat we al weten wat er gaat gebeuren in de toekomst. We weten dat een aantal personages dood gaan in de toekomst, terwijl ze hier nog springlevend rondlopen. Na zo'n 100 pagina's ging het verhaal echter beter lopen, en het einde was toch We keren terug in de tijd naar de tijd van net na de Riftwaroorlog. We zien een aantal oude bekenden terug, maken kennis met nieuwe helden. So this book was actually adapted from the game, "Return to Krondor" which I believe was a very popular 90s game. I read it because I’ve been slowly reading through Raymond Feist’s Midkemia books. It was interesting to see a narrative pattern where instead of the try-fail cycle, you have a try-succeed try-succeed cycle – obviously because it's adapted from a game format but arguably, not so well because in book format it doesn’t make for a great read. But it was interesting for a while to see a So this book was actually adapted from the game, "Return to Krondor" which I believe was a very popular 90s game. I read it because I’ve been slowly reading through Raymond Feist’s Midkemia books. It was interesting to see a narrative pattern where instead of the try-fail cycle, you have a try-succeed try-succeed cycle – obviously because it's adapted from a game format but arguably, not so well because in book format it doesn’t make for a great read. But it was interesting for a while to see a book written like this just because it’s so different and goes against age old writing advice for creating conflict in a narrative. So was there any conflict? Well that’s something Feist has a major problem with. There’s always overall conflict in his stories, e.g. armies on the move and evil forces at work. But there’s seldom any internal character conflict or relational conflict between characters and that’s ubiquitous in Feist’s writing, although it was arguably improved on in the Serpentwar after the Riftwar books. Books he co-authored fall into a different category because they’re vastly different to the books Feist wrote alone. I’m talking style, tone, characterisation, internal conflict, political complexity etc. I enjoyed Gorath’s character; obviously I knew that he wasn’t going to make it because he doesn’t show up in the later books in the chronology of Midkemia. I liked his story arc because I’m a total sucker for redemption arcs. The returning of the Moredhel to the Eledil is an interesting concept that Feist hasn’t explored nearly enough in his world. I’ll give Feist a tiny bit of leeway for having elves in his world because "Magician" (his debut novel) was released in the early 80s so Feist was probably already world building in the 70s, when Lord of the Rings had taken the world by storm and begun a new era for the fantasy genre. BUT, LoTR came out in the early 50s, so it was ... 30 years later. Anyway, since the 70s and 80s we’ve learned that including elves is not an original way to write fantasy because it always comes off as something of a Tolkien rip off. But anyway, Midkemia does have elves but what I find unique and different to LoTR elves was that the dark elves or "moredhel" in Midkemia have this chance to “return” and basically be redeemed when they turn away from their war-like ways. What’s also cool about Feist’s moredhel is that they are not a simple opposite of the eledil. Where the eledil are peaceful, the moredhel are warlike. But they’re not born bad. Unfortunately Feist pigeonholes them as servants of evil more often than not, or too stupid to realise that they are being duped into serving evil forces. And this feels weak and generic to me. It’s like he accidentally stumbled on such a cool race but never explores their culture or society. With the introduction of Gorath, for the first time after reading 12 books set in Midkemia we glimpse how moredhel societies work. They have their own culture, their own kind of honour, a clan hierarchy that is as often matriarchal as patriarchal, and conflict between clans. Unfortunately it’s such a brief glimpse that it remains unsatisfying and isn’t nearly enough to redeem this book. But I really enjoyed the little episode involving Queen Liallan, and Gorath’s ex-wife Cullich. The other really interesting aspect of it having been written after the game was released was it’s really really well visualised and I think the obvious reason for that is because the concept art and game graphics came first. All Feist needed to do was describe what he saw instead of imagining scenes and settings. It’s a really interesting thing to think about. I found it so easy to visualise the battle scenes and the settings that I believe that’s one thing at least that can be learned from what is otherwise not a great book. Fantasy authors very often do little sketches and drawings as they write because people are much better at describing things we’ve actually seen. And that's what happened in this book. I did sort of enjoy this because I went in with very low expectations. I’ve read a lot of Feist’s work in the past and I’ve only highly rated one or two of about 15 books of his that I have read. Most of his books are solid but nothing really special. I was pretty tired of Feist when I stopped reading his stuff about a year ago but this is a relatively short book and I just decided to read it since I own it. Then as the story got moving, it was actually really fun, it’s not a serious fantasy by any means, but it’s quite fun. It felt like a playful romp in a setting that I used to know well. But… 3/4 of the way through, I started getting bored and by the end I was very bored. With the try-succeed pattern repeating throughout the story there is a sort of childishness to the plot, because there are a LOT of plot points but they’re all glossed over at high speed so the characters can move on to the next “quest”. There’s no real tension in any of it, even during the siege that Jimmy has to command. I think if Feist had approached writing this with more humour it would have worked so much better. Instead it reads like a poorly aimed stab at an epic fantasy that just falls completely and utterly flat. Overall, my opinion is that there are altogether too many plot points that followed try-succeed cycles to make for a tight, interesting plot. Particularly the part where Pug goes to the other world and they’re touching crystal pillars and communing with dead gods on a dead world to get Gamina back. That was so obviously a ploy to get Pug out of the way so he couldn’t swoop in and deus ex-machina the ending. Feist is honestly the king of deus-ex-machina endings and that’s my biggest problem with him as a writer. That part was also so obviously lifted right out of a game narrative, it was painful to read. I felt that for a better adaptation into book format a lot more of the game’s original story needed to be cut out and then the parts that were left should have been fleshed out. I ain't gonna lie ..... I liked this book. I needed this book. It was a welcome change in my reading world. Love that it had a map to follow all the book activity. Loved it more that you can find a better map online, as well as a complete interactive role playing site of said world as well. Haven't gotten into that yet, but I'm game to try it out! I've always wanted to have an alternate elf ego ....... just have to come up with an appropriate elf-like queenly name! Oh yes my friends - it's good I ain't gonna lie ..... I liked this book. I needed this book. It was a welcome change in my reading world. Love that it had a map to follow all the book activity. Loved it more that you can find a better map online, as well as a complete interactive role playing site of said world as well. Haven't gotten into that yet, but I'm game to try it out! I've always wanted to have an alternate elf ego ....... just have to come up with an appropriate elf-like queenly name! Oh yes my friends - it's good to be a queen!! Hahahha! I won't go into details of the story plot. Suffice it to say that it's really about discovering hidden strengthens and honor that shines at the appropriate times to the delight of all. I think the story would have been richer for me if I had read anything by Raymond Feist prior to this book, as he has devoted a few series that revolve around this particular world, but I feel happy knowing that they are there to be discovered by moi at a later date. I'm equally excited that there are a few more books in this particular series as well, as I came to thoroughly enjoy some of the characters of this one and would like to see how they develop further. Ahhh - life is good! Dit boek heb ik voor de tweede keer gelezen. Het is zoals bijna alle boeken van Feist de 5 sterren meer dan waard. Wederom is het spannend heeft het veel afwisseling en vaart. Het leest dus makkelijk weg. Wat ik de laatste keer heb gemist is dat deze serie eerst n spelvorm was waarna Feist er een boekenserie van heeft geschreven. Het brengt een aantal bekenden ten tonele zoals Martin Langboog, Prins Arutha, Robbie de Hand en jonker Joolstein maar ook nieuwe karakte Recensie kan spoilers bevatten. Het brengt een aantal bekenden ten tonele zoals Martin Langboog, Prins Arutha, Robbie de Hand en jonker Joolstein maar ook nieuwe karakters als Owyn en Gorath een "zwarte" elf. Het is tien jaar na de slag om Sethanon. Zwarte elfen dringen opnieuw het koninkrijk binnen. Jonker Joolstein op missie in het barre noorden ontdekt de op hand zijnde nieuwe invasie van de broeders van het onzalig pad. Deze broeders worden terzijde gestaan door 6 mysterieuze magiers. Magier Puc is er niet gerust op maar wordt in eerste instantie op slinkse wijze buitenspel gezet. Kunnen Owyn & Gorath Puc helpen en het koninkrijk redden? If I recall correctly, good old Uncle Feist hasn't taken part in making the 1993 video game. Only at a later stage did he become involved, and wrote his own book version afterwards. This explains why Krondor: The Betrayal reads like a video game put to paper. Game features like the constant ambush scenes and side quests simply don't work in the writte narrative. On the other hand, the book lacks the features that gave the video game its remarkable and unique atmosphere. Descriptions are rough at If I recall correctly, good old Uncle Feist hasn't taken part in making the 1993 video game. Only at a later stage did he become involved, and wrote his own book version afterwards. This explains why Krondor: The Betrayal reads like a video game put to paper. Game features like the constant ambush scenes and side quests simply don't work in the writte narrative. On the other hand, the book lacks the features that gave the video game its remarkable and unique atmosphere. Descriptions are rough at the best and a reader who doesn't remember all the game's visuals and music just can't get the immersion. Instead of adding one boring fight scene after the other, Uncle Feist should have put more efforts in making the reader immerse in the colorful world of Midkemia. I bought this book when I was a kid because I was obsessed with the computer game. I never managed to finish the game, but I read this book over and over again. I adored the characters, especially James. I went on to read the previous Riftwar Saga, and though I tried to read other books by Feist, they weren't the same without my favourite characters. Recommends it for: most people- if you have read the preceding novels. This is a good addition to the Riftwar Saga, but there are levels and intrigues and depth of character in this book that are simply not understood if you have not read at least the core books. You need to read at least both of the Magician books by the same author. That being said, this was an interesting and diverting book to read. I really enjoyed it. Gebaseerd op een computerspel en leest als een computerspel. Soms een beetje te 'simpel'. Het verhaal mag wat meer om het lijf hebben. De oude bekenden van de eerdere boeken doen weer waar ze goed in zijn. The Riftwar Legacy was horrible, trite, pithy, predictable, sad... I couldn't get past 50 pages. Maybe I just couldn't appreciate it not having read any of the others before this. After reading The Empire Trilogy it felt like a blast. But then I compared it to The Riftwar Saga and it felt like very average even bad book. Character A completes mission talk to NPC X. Then Character A has to travel to City and talk to NPC Z. Only thanks to author's skill it doesn't fell obnoxious. But it's hard to shake the feeling that the book was made in some sort of rush. Also I feel Feist didn't know what to do with already developed characters. Despite bloody events of previous books, even traumatic to many people Arutha and his squires didn't change at all. No these squires would remain the same after stuff they saw. And yet they did. New characters as always are developed well, even though it's more rushed than in Riftwar Saga. And the conclusion. It really sucked. It felt like reading about character entering inn while he has slightly uphill road. Not completely blissful walk however absolutely didn't felt like hard work. Feist's Riftwar cycle is one of those series that in the 80s and 90s I wished I had time and money to get into. Catching the complete Riftwar Legacy series at outlet pricing and lacking willpower at the time I grabbed all three. I'm not sorry except jumping in with Krondor The Betrayal it feels like I'm missing backstory. Krondor The Betrayal is suitable nevertheless as a standalone generic pseudo European fantasy adventure complete with all the standard trappings plus Feist's interesting spin. T Feist's Riftwar cycle is one of those series that in the 80s and 90s I wished I had time and money to get into. Catching the complete Riftwar Legacy series at outlet pricing and lacking willpower at the time I grabbed all three. I'm not sorry except jumping in with Krondor The Betrayal it feels like I'm missing backstory. Krondor The Betrayal is suitable nevertheless as a standalone generic pseudo European fantasy adventure complete with all the standard trappings plus Feist's interesting spin. Three standard fantasy races. Dark elves who aren't really. Nice take on elven relations. Dwarves that aren't Peter Jackson's. Pseudo-feudalism. Cunning thieves. Assassins and thieves guilds. Pervasive distant third person made the characters seem a little flat even though their words and deeds indicated they were anything but. It sounds like I'm just going to rag on this book and you're wondering why I would give it 3/5. Having played a little of the "Betrayal at Krondor" video game back in the 90's, I was really interested to see how books based on the game turned out. I hadn't ready any Raymond Feist books previously, so I was only biased by what I remembered of the game almost 25 years prior. The plot was decent, character personalities were entertaining, and the world is enjoyable, but it felt like something was missing. The descriptions of the characters' and environments' appearances were minimal and I'd fi Having played a little of the "Betrayal at Krondor" video game back in the 90's, I was really interested to see how books based on the game turned out. I hadn't ready any Raymond Feist books previously, so I was only biased by what I remembered of the game almost 25 years prior. I am reading this is more of a publication order. So this falls a lot further back in the time line with characters like Jimmy, Arutha and Locky. It was nice to go back in time to visit some characters at this part of their journey. James and Locky still only squires. There is some mention of the Empire and the Acoma that helps illustrate the timeline. It holds up mostly because my interest in the characters. I have gotten used to the tangled webs and intrigue in a way that Feist writes, but thi I am reading this is more of a publication order. So this falls a lot further back in the time line with characters like Jimmy, Arutha and Locky. It was nice to go back in time to visit some characters at this part of their journey. James and Locky still only squires. There is some mention of the Empire and the Acoma that helps illustrate the timeline. It holds up mostly because my interest in the characters. I have gotten used to the tangled webs and intrigue in a way that Feist writes, but this one is a lot more of a straight line. It feels like the characters opened their own choose your own adventure books to follow their quest lines. While it is not bad, I feel like it is missing something. I really enjoyed, this the first in The Riftwar Legacy series. It is a bit disconcerting as it set before the previously read Serpent War Saga so characters that had died during the Serpent War are now very much alive. I was prepared for a poor book given the volume of negative comments regarding this book as it was in reality a novelisation of a old video game. Maybe my opinion would have been different if I had previously played the game, but coming to it fresh I thought the plot was engagin I really enjoyed, this the first in The Riftwar Legacy series. It is a bit disconcerting as it set before the previously read Serpent War Saga so characters that had died during the Serpent War are now very much alive. I was prepared for a poor book given the volume of negative comments regarding this book as it was in reality a novelisation of a old video game. Maybe my opinion would have been different if I had previously played the game, but coming to it fresh I thought the plot was engaging and consistent with the previous Riftwar novels I’ve read. The Brotherhood of the Dark Path are on the march again. Being led back to Sethanon by the lie that Murmandamus is alive and being held a prisoner there. Thrust into the limelight Owen Locklear and Jimmy the Hand must decide the fate of the kingdom. It is an epic fantasy saga- with wonderful world building and scene setting, and dynamic, vivid and detailed descriptions that will transport you right into the story. I love the riftwar saga books (and re read them again recently) but had never read the legacy series so.... Sadly, as much as I love Feists other books this one was disappointing. It felt a bit rushed and I have to say that I'm not going to read the other 2 books in this series. I feel bad saying this, but if you're reading this review wondering if you should read his other books (particularly the Riftwar Saga) you should! I still love that series!! Strange goings on in the land of Krondor as the assassins known as the night hawks appear to be back. One of the dark elves escapes his companions to warn the kingdom men about an impending attack. It seems that a dark elf has taken power and is planning an invasion. Jimmy the Hand is on hand to investigate and fight against the invasion. All good stuff with the usual colourful characters of Feist’s world and plenty of battle scenes.